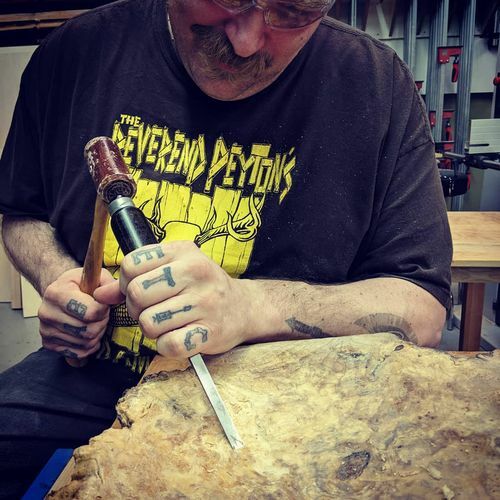 Does anyone have any experience carving heavily spalted wood? I turned the bottom of this platter on the lathe but the top was to soft for the lathe. I started carving out the top with a grinder but that was to aggressive. I tried 220 grit on a palm sander, but that was to aggressive as well. I poured some Minwax wood hardener in to it. That helped but it was still to soft for any kind of blade or even the sander. So I poured some super thin CA in it. This hardened up most of the plate but there was one area where the CA just formed a crust on top of the wood. The crusted area collapsed and formed a dent. I cut the crust of with a chisel but now I’m having the same problem in the same place. 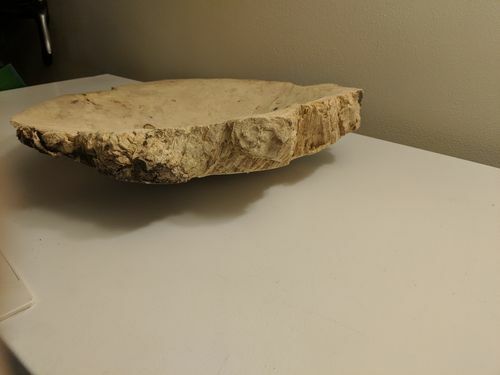 Does anyone have any ideas of how to deal with this section of the platter? Is there another product that I should try? Should I just punch a hike through it there? The platter is an irregularly shaped art piece with no functional value. I already showcase a broken edge as a major feature near the site of the collapse. Pictures? Sounds to me like it is way past spalted and into rotted. Unless you have a stabilizing chamber and a bunch of Cactus Juice resin, it sounds to me like it’s going to be tough going. Can you still mounti it on the lathe? Maybe you can rough it out with a variable speed grinder and a flap grinding wheel? The grinding wheels are less aggressive than the grinding disks and with variable speed you will have more control. Once roughed out, you can try finish shaping with coarse sandpaper on a sanding disk on a drill and then work your ways up the grits to get a slightly better finish. I haven’t been able to post a pic in months. Everyone I try it says that photo bucket refuses to connect. I miss being able to directly upload pics from my phone. I really think I’m just going to move to a site where I can post pics more easily. I think that photobucket changed their policy about using their site to show photos on other sites. Just upload images directly to lumberjocks. After you click the image button, press choose file button. After you have selected the file on your phone and uploaded the image, click the insert image button and it will put a link to your image into the text. 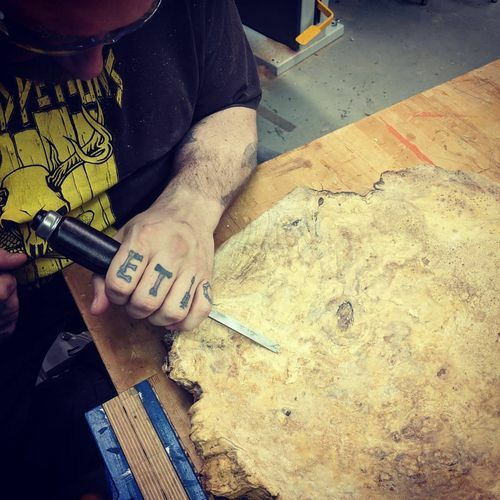 Looks like you’ve got a burl there. It should look amazing once it’s got a finish on it. You can preview the grain by whiping some mineral spirits or denatured alcohol on it. What kind of finish have you got planned? EDIT: Hah! 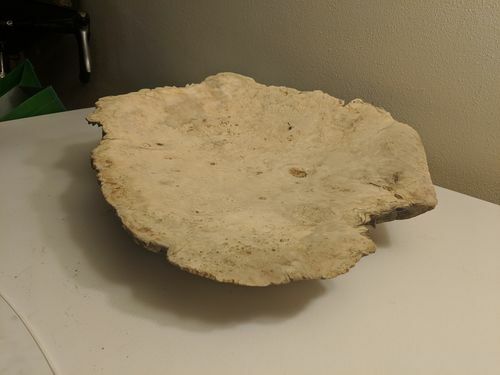 Just realized that the title said it was a burl. It’s too porous for the mineral spirits trick to work. For the finish I will have to use some type of top coat. A penetrating finish wouldn’t cure well, and there is already a lot of product in the wood. Probably a traditional lacquer. Any recommendations? I have not used much lacquer so I can’t comment on that and I don’t any experience trying to finish a spalted burl either for that matter. If the wood is that porous, I would worry that you might get bubbles in some film or resin type finishes as air tries to escape as the film starts to set up? I’ve had that problem with an epoxy finish before. I wonder if it would do any good to use a shellac sealer on it first or even just use shellac. I use spray on finish for the most part, but I have used sponges to wipe on poly finish with pretty good results. The key is to use a lot of thin coats.